Compared to signs and other roadside objects, pedestrians are hardest to see at night. That the right lane ends and traffic should merge left. That the road curves ahead. 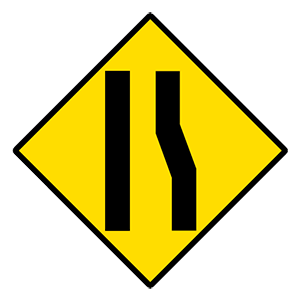 This sign indicates that the right lane on a multilane roadway ends ahead. Traffic in the right lane must merge left. Unless otherwise posted, the speed limit in cities and towns is 25 mph. When riding at night, the bicycle must have a white headlight visible for 500 feet and a red reflector visible for 600 feet to the rear. A flashing taillight or a steady red taillight may be used in addition to the red reflector. Begin signaling as you move into the next lane. Signal at least 500 feet before your lane change when driving on residential streets. Always check your blind spot. Other cars and motorcycles are often hidden in a vehicle’s blind spot, so be sure to glance over your shoulder before you begin a lane change. Begin signaling 100 feet before changing lanes or turning in a residential area. Signal five seconds in advance when changing lanes on a freeway.